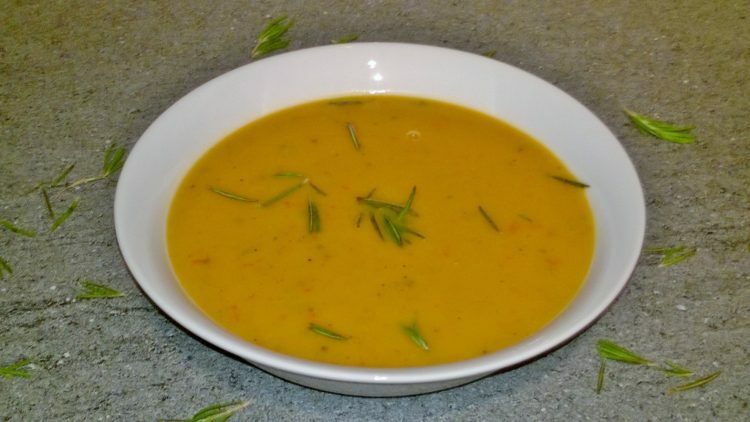 This soup is a warming boost of vitamins and minerals in a bowl; packed with goodness it is perfect for both lunch or dinner on those cold wintery days. 1 Put the butternut squash, garlic, rosemary and 1 tbsp of coconut oil into a bowl massage and toss until coated in the oil. Then place on to a baking tray, and place the tray into a pre-heated oven on 220c/450f/Gas 8 for 15–20 minutes until golden, then remove and set aside. 2 Add the rest of the oil in a large heated saucepan on a medium heat. 3 Then add the spring onions, red pepper and celery and cook for 2-3 minutes stirring occasionally. 4 After the 2-3 minutes add the red chilli, stir and leave to cook for 1 minute. 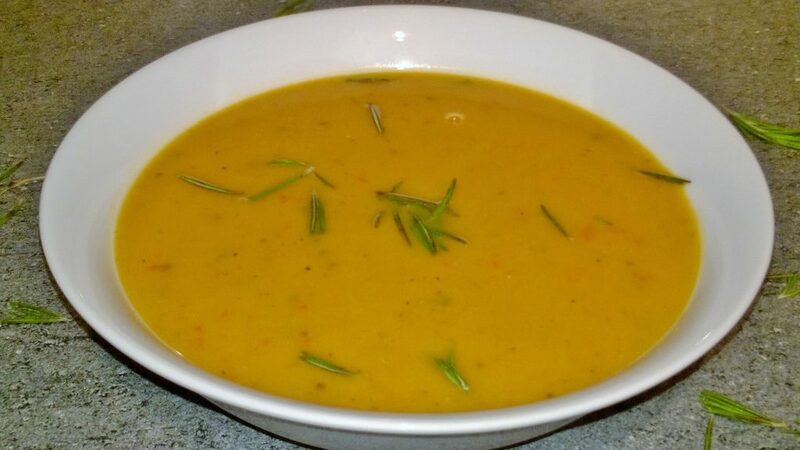 6 Then add the roasted butternut squash, rosemary and garlic to the saucepan along with the vegetable stock and 1 litre of boiling water, stir, turn the heat up high and bring to the boil. 7 When it comes to the boil add in the butter beans, stir and bring back to the boil. Then turn the heat down to a medium heat and cook for 5 minutes, stirring occasionally. 8 After 5 minutes remove the saucepan from the heat and ladle half the soup from the saucepan into a blender jug, blitz until smooth, then pour it into a heat-resistant bowl. Ladle the other half of the soup into the blender jug and blitz until smooth. Then pour the soup in the blender jug and the bowl back into the saucepan and stir the soup. 9 Add the cracked black pepper, stir and bring to the boil on a high heat. 10 When it comes to the boil turn down to a low heat and leave to cook for 5 mins, occasionally stirring. 11 Then remove from the heat, stir and leave to stand for 5 minutes. After 5 minutes it is ready to serve. Butternut Squash is low in calories and contains no saturated fats or cholesterol and is high in dietary fibre. It has more vitamin-A than a pumpkin, which is in important for a healthy eyesight and helps protect your body against lung and oral cancers. It is rich in B-complex vitamins and like pumpkin contains it iron, zinc, copper, calcium, potassium and phosphorus. Spring onions (Scallions) carry more anti-oxidants and dietary fibre than onions and shallots; they have anti-bacterial, anti-viral and anti-fungal properties. They help lower your blood pressure and protect against heart disease and strokes. They also contain vitamin-C, vitamin-K, B-complex vitamins and folic acid. Rosemary has the ability to boost memory, improve mood and stress levels, heal skin conditions and relive pain. It has anti-inflammatory, anti-fungal and anti-septic properties. It is rich in dietary fibre, folic acid, vitamin-A, vitamin-C, potassium, calcium, iron, manganese, copper and magnesium.